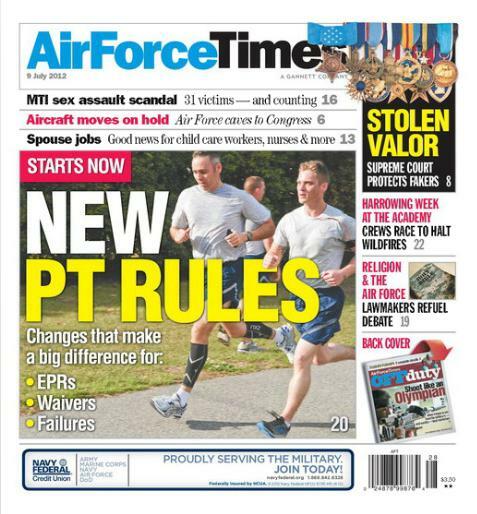 Pay attention to the latest changes to the PT test because they can make the difference between staying in the Air Force and looking for a new job. You can read more about when you will need to take the test and how much discretion your commander will have to end your career. Meanwhile, airmen continue to battle wildfires in Colorado. At least four C-130s equipped with modular airborne firefighting systems have been sent to the fight. The planes have a crew of four or six airmen and can drop 3,000 gallons of flame retardant in an area at any given time. One of the planes crashed on Sunday evening while battling a fire in South Dakota . Officials have not yet released the status of the crew. And the Air Force has put on hold a plan to transfer F-16s from Eielson Air Force Base in Alaska to Joint Base Elmendorf-Richardson near Alaska after a Senator blocked the nominations for top Air Force leadership positions. Sen. Mark Begich, D-Alaska, said he will now lift his hold on the promotion of Lt. Gen. Herbert “Hawk” Carlisle to become the new Pacific Air Forces commander.